Nathaniel Barlow, winner of RIT's Richard and Virginia Eisenhart Provost's Award for Excellence in Teaching and the Innovative Teaching with Technology Award. 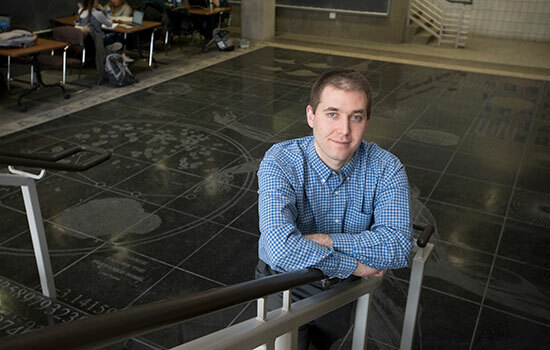 Nathaniel Barlow is part professor, part performer in RIT’s School of Mathematical Sciences. His playful teaching style and insightful techniques have earned him the Richard and Virginia Eisenhart Provost’s Award for Excellence in Teaching and the Innovative Teaching with Technology Award. Barlow was “over the moon” when he won the first award and in disbelief upon word of the second. Barlow teaches differential equations, partial differential equations, calculus and boundary value problems, and a hybrid linear algebra/differential equations course that many industrial engineering students take. For Barlow, the delivery is as fun as the subject matter. “I feel that I can provide an experience for students that they can’t get while watching a YouTube video or even by reading their textbooks,” he said. Entertaining comes easily to Barlow. He played guitar and drums in several heavy metal rock bands during high school and overcame stage fright in his teens. Barlow recognizes a familiar pattern in planning, rehearsing and performing in front of people. Back then, it was Metallica and Judas Priest; now, it’s fluid dynamics and calculus. Underneath the delivery, his lesson plans are grounded in two core concepts: creating an inclusive classroom and meeting students where they are with math and building them up. When Barlow joined RIT in 2014, he already had an ongoing collaboration with Steven Weinstein, professor of chemical engineering in the Kate Gleason College of Engineering. They established the Barlow/Weinstein Asymptotics and Wave Instability Group and hired an interdisciplinary team of undergraduate students in applied mathematics, computational mathematics, chemical engineering, industrial engineering and, most recently, from the mathematical modeling Ph.D. program. The first award recognizes Barlow’s talent in the classroom—his ability to connect with students, convey content and inspire. The Innovative Teaching with Technology award honors his clever use of technology to convey difficult concepts. Math problems that involve 3D surfaces and vector fields require spatial thinking and are not easy for everyone to grasp. Barlow taught the complex equations using 3D glasses and red/blue slides until the semester a student introduced him to 3D printing. Colin Huber, now a student in the mathematical modeling Ph.D. program and a member of the Barlow/Weinstein Asymptotics and Wave Instability Group, came to class every day with a different 3D-printed object. Huber and other students taught Barlow how to make 3D-printed models of three-dimensional equations. Since then, the palm-sized plastic models have replaced the 3D glasses. Barlow won the Innovative Teaching with Technology award for adapting the technology as a teaching tool in his undergraduate courses. RIT math student Olivier Montmayeur became Barlow’s Learning Assistant through CASTLE, the Center for Advancing STEM Teaching, Learning and Evaluation at RIT, and developed and conducted workshops in fall 2017 using three-dimensional prints for Barlow’s Boundary Value Problems class. Barlow, Huber and Montmayeur published their findings in “Riding the ‘wave’ of Affordable 3D Printing: Applications to PDEs in teaching and research,” in the Dynamical Systems Web, in November 2017.